Remember our very first guest designer on Hanover Avenue? Well, she’s back! See how Vanessa Matsalla, the mastermind behind Studio Matsalla, delivers her famous relaxed, well-traveled Cali aesthetic in this intimate look at her own bedroom. Watch this behind-the-scenes video with Anne and Vanessa to get a deeper look into Vanessa’s design choices, learn more about her studio and find out how you can bring this look into your own bedroom! Vanessa injects ink black in the black lampshades, footstool, concentric circles in the lamp base and again through the pattern of the rug. Perfecto! 2. Skimp on the linens, splurge on the pillows! If you’re on a tight budget, less expensive white bedding won’t make a huge difference, so don’t be afraid to let the pillows really shine. Layer textures and invest in quality pillows because a) they usually don’t get washed that often and b) they are often one of the key design elements of the bedroom. 3. Balance simple, stripped down furniture with texture, texture, and more texture in the accessories! 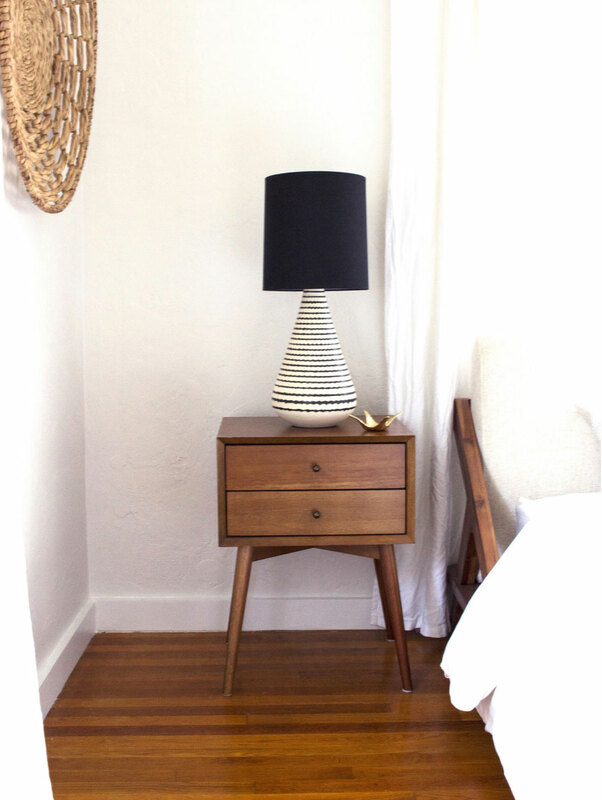 To create visual interest against the distilled nightstands and dresser, Vanessa added the cool shaggy rug and faux feather round stool. Love it! 4. Choose the perfect hue to establish the room’s foundation! For Vanessa’s bedroom? Valspar‘s inviting Woodlawn Bedroom White. A classic, mellow white, it offers a versatile canvas for adding prints and patterns. Here’s why she uses it not only in this room, but in her professional studio as well! 5. Keep your accessories simple and don’t overthink it! This signature design tip from Vanessa is what truly sets her apart from the rest. While homeowners may feel the need to fill every space and void, she meticulously curates pieces that contrast well against one another to create thoughtful dialogue. Each accessory is perfectly placed with intention and never feels fussy. Genius! We’ve said it so many times and we’ll say it again: never, EVER let your room look like a store showroom or paint-by-number! When it comes to artwork, display pieces that truly mean something to you. We always try to choose art from local artisans, street vendors or one-of-a-kind artists. Doing this doesn’t just support small businesses–it helps give your room a story and creates heirlooms! Vanessa is a design gem and we are honored to have her on Hanover Avenue for a second time! The best part is when you buy items from her store, Studio Matsalla, you are supporting women from around the world! Everything is sustainably crafted and helps give back from the communities where they were made. PS How cute is her store?! I want everything in here! PPS You can buy on-line too, bonus!! **Update! Studio Matsalla has just gotten a fantastic spread on Glitter Guide – yay, Vanessa! Check it out! 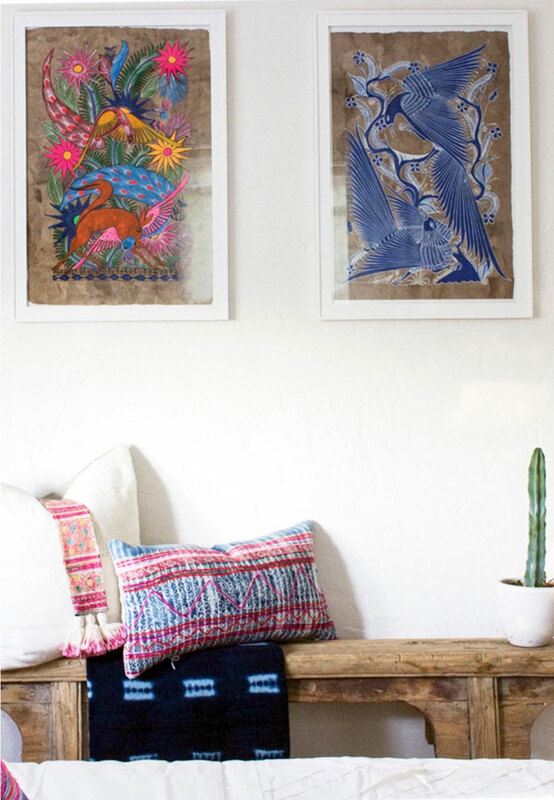 Learn Some Design Tips from Vanessa using goodies from her Store!